Hey all! 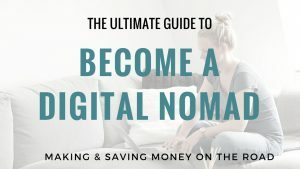 Next to regular life in Lima, I spent at a weekend in the jungle last week! 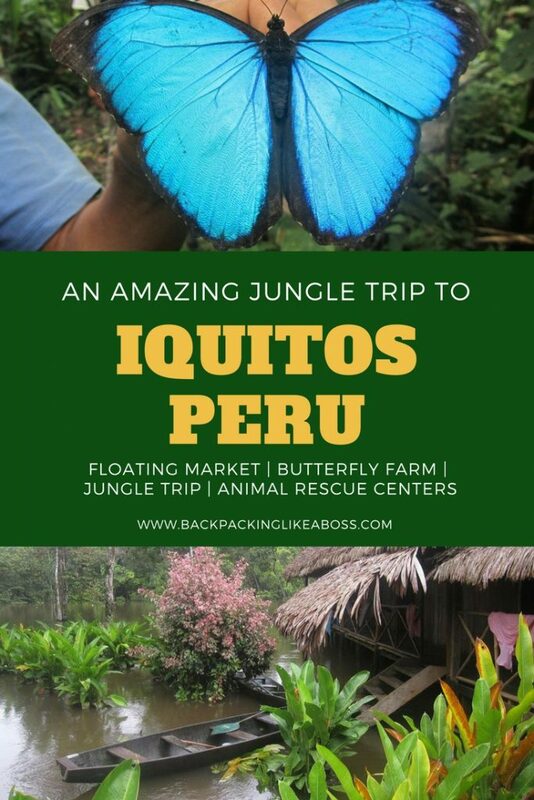 When you want to go to the Amazon Jungle in Peru, you basically have two choices: going to Iquitos, or going to the Peruvian Amazon in Tambopata National Park near Puerto Maldonado. Because Iquitos was more affordable at the time and thus better for our student budget, we decided to go there. 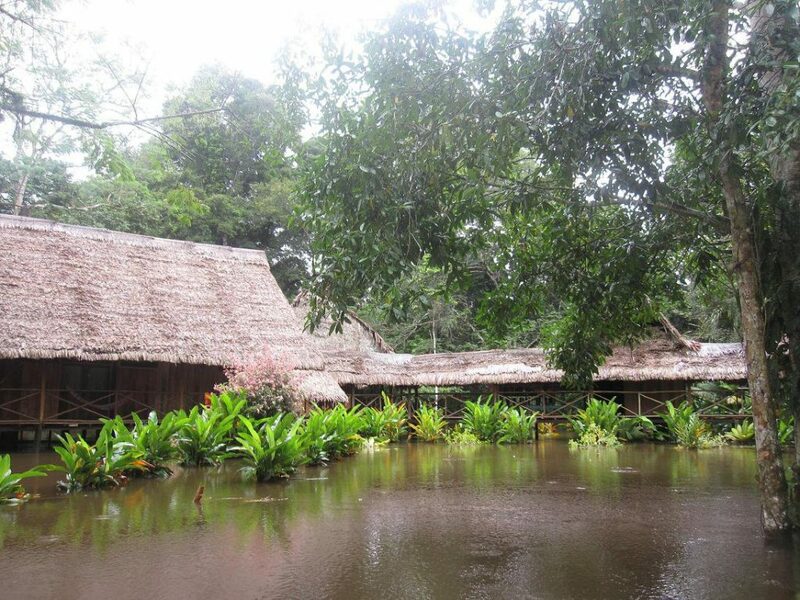 But if I ever go again, I would definitely try one of the amazing Amazon lodges in Tambopata National Park! Wherever you decide to go, your jungle experience will be one to remember! 5 The Way Back – Snakes! 6 A great trip to Iquitos! Last Thursday I took the afternoon flight to Iquitos together with Dominique and Marta! 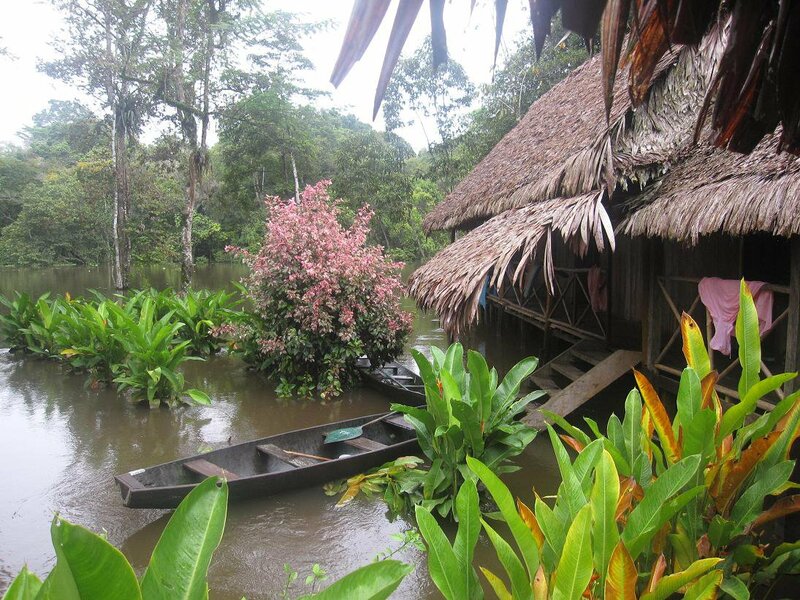 Iquitos is about 2 hours away by plane, or otherwise accessible by a 5 day boat trip from the last town before Iquitos accessible by road. 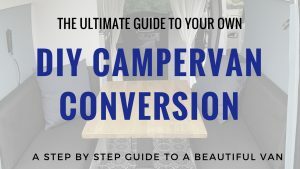 It was the first time ever in the jungle and I didn’t know what to expect! When we got out of the plane it was like walking against a wall of heat – LOVE IT 😀 so nice and warm! We were pretty panicking about mosquitos, malaria, yellow fever and dengue, so we started the mosquito repellent right away! We took a moto-taxi to our hostel: a hostel floating on the river! 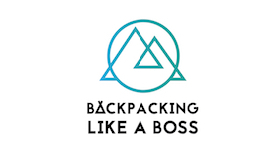 A very nice hostel with a good location 2 blocks of the main plaza. There were some dogs around which protected the hostel, and the party went on until 3am so it was not quiet at all. But, fortunately the scrambled eggs with ham and tomato next day pretty much made up for that! 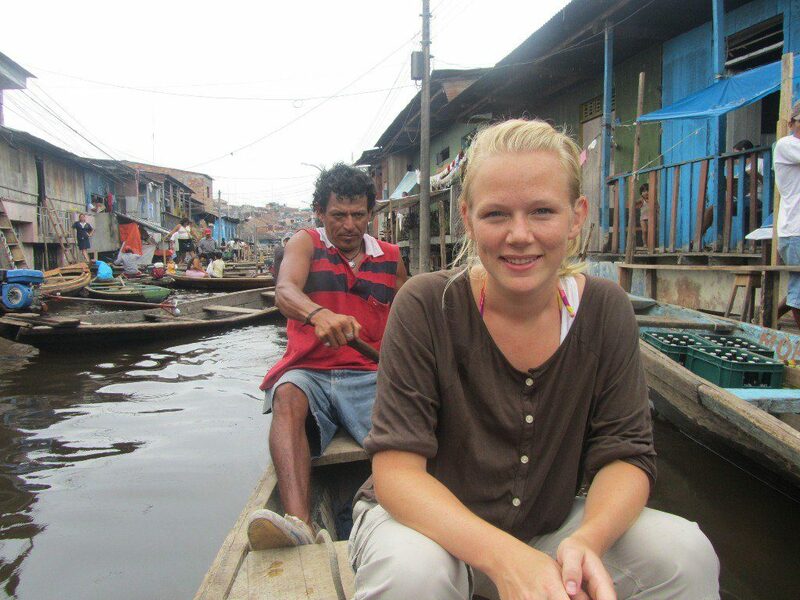 That day we took a boat tour to the floating market of Belen, a neighbourhood in Iquitos. 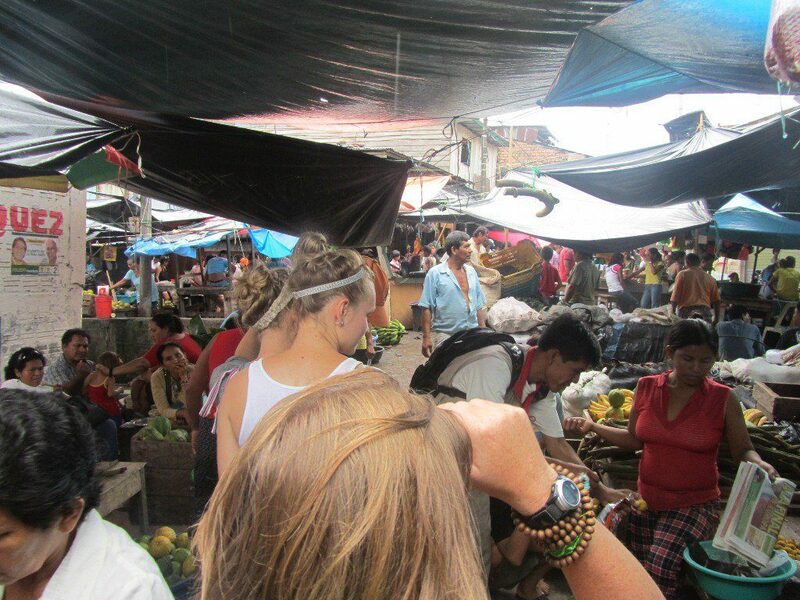 This was a huge market with loads of fish, jungle fruits, medicinal herbs and other crazy stuff! Very impressive but not too safe – we got escorted out by the local police! That’s why most people take a guided tour to get a good impression of the area, but still stay safe! 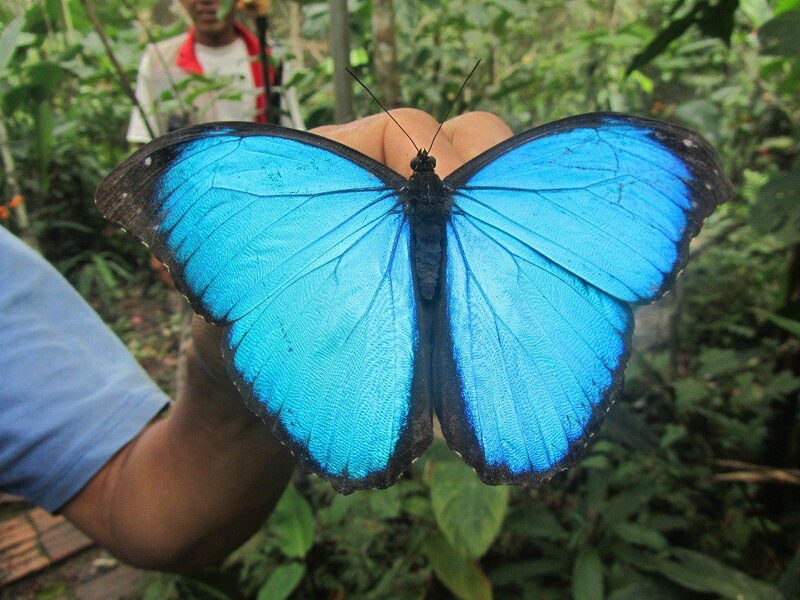 Then we continued to a Pilpintuwasi Butterfly farm. A stunning area with tons and tons of butterflies which will truly amaze you. The farm also functions as a rescue center for animals that were about to be smuggled and sold for a lot of money. Here we saw amazing butterflies, a jaguar, some weird ants and some more cool animals! After this we continued our boat ride over the amazon to get back to the hostel late afternoon. After a pizza and a beer it was time to go to bed, because next day we would leave for the real JUNGLE!!! 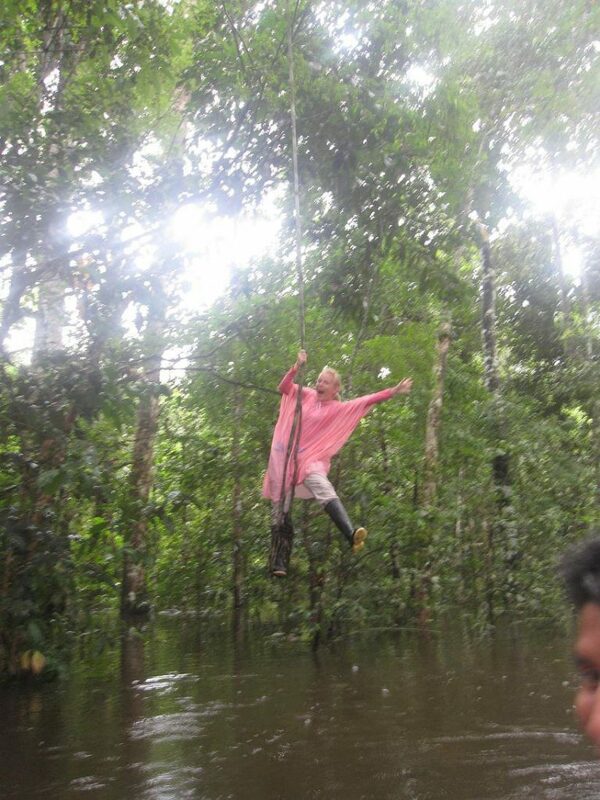 My objective for the whole trip to Iquitos was to find Tarzan, but unfortunately that did not work out! 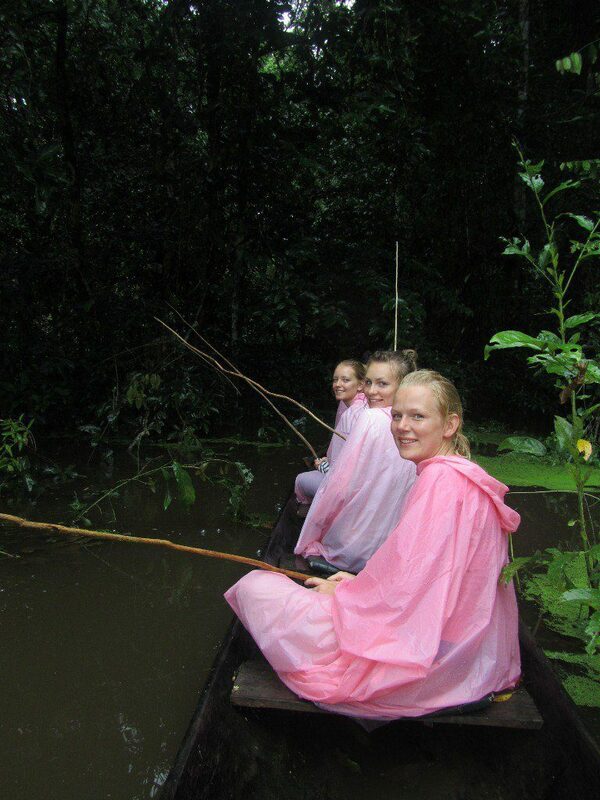 We did other awesome things though 🙂 On the first day in the jungle we took a boat to our lodge which was really pretty! The only bad thing was that it was right to a local village – which had a big party on saturday night!! 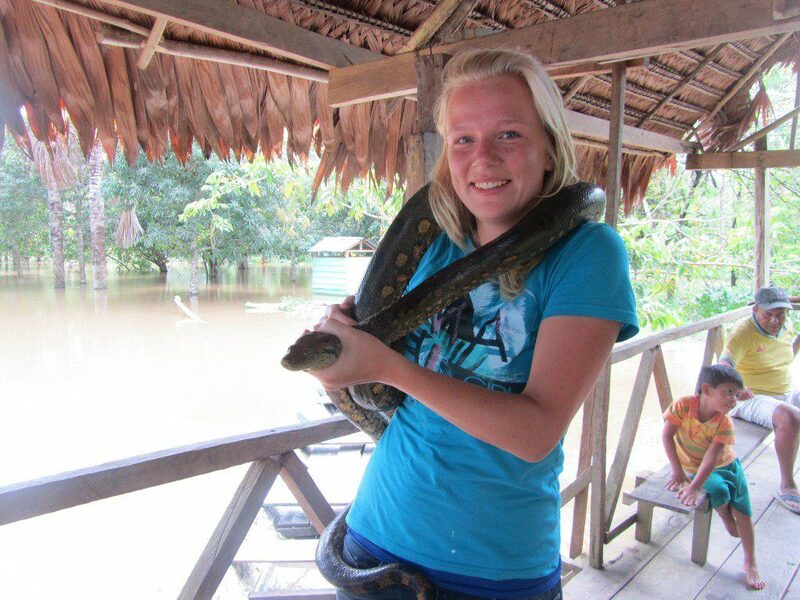 It’s kind of crazy hea, being in the jungle and still unable to sleep because of a party :P.
The Way Back – Snakes! On the way back to Iquitos we visited an NGO that rescues orphaned or abandoned animals. Here the monkeys really liked us and jumped in the boat to hug a bit! I also got to hold a snake. Snakes are definitely in my top 10 of biggest fears ever, so this was a really big thing for me! Feeling those muscles of the snake move is truly scary, they can constrict you in a second!! Altough we didnt see too much wildlife truly in the wild, the list of animals weve seen is still pretty impressive: pink river dolphins, anaconda, monkeys, sloth, piranhas (even at them for breakfast! ), spiders, jaguar, anteaters and probably even more that im forgetting now!! 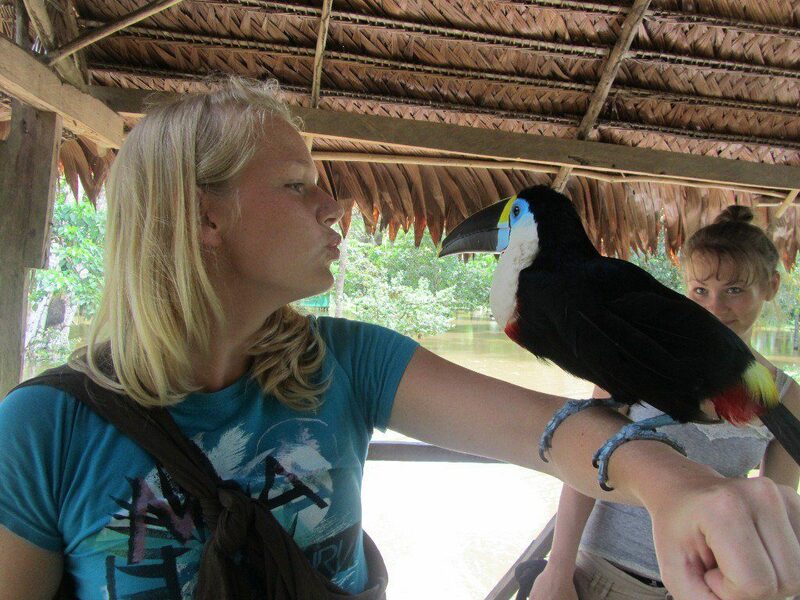 A great trip to Iquitos! I can definitely recommend a 3 day trip into the jungle to really experience it to the fullest! Especially going out with the canoes into the nature was a terrific adventure. We had so much fun and did not feel unsafe at any moment. 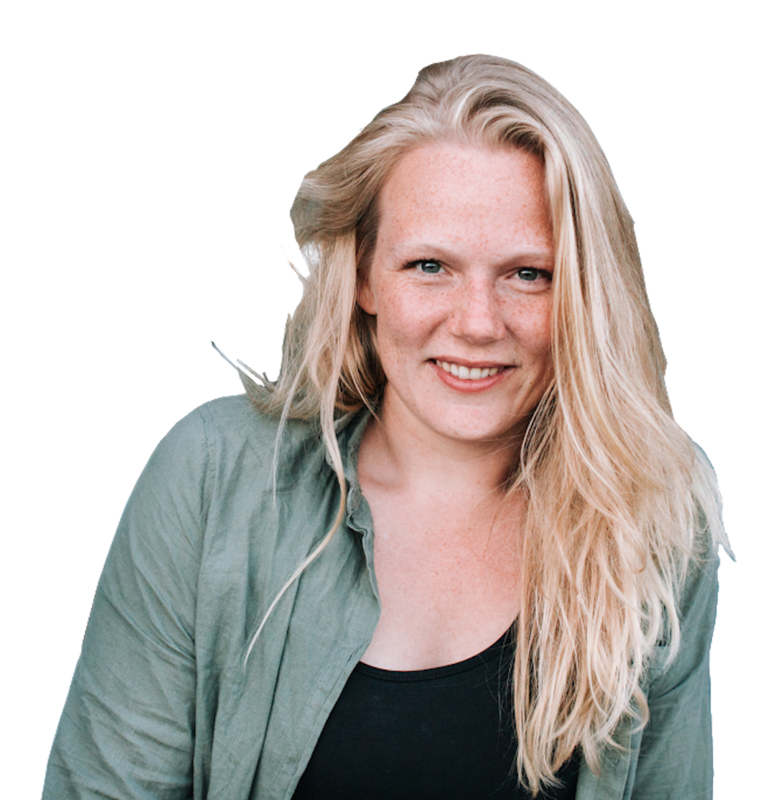 Pin this post to your Pinterest boards to get inspired for your trip to Iquitos!